A funeral service can be very short and quiet with only a few member of the family present or an occasion of great solemnity with music, hymns and a packed church. Services can be tailored to the special needs of the deceased and their family. In all matters, you can expect to receive the sensitivity and care that befits the sense of loss and grief when we lose loved ones. Who can have a funeral at St John’s? You do not have to be a parishioner for you or a deceased member of your family to have a service at St John’s. Initial arrangements are usually made between the family, the chosen undertaker, and the Vicar. 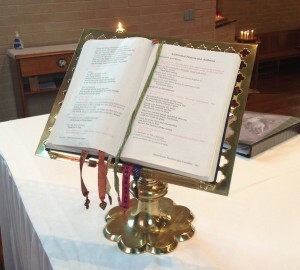 Things such as the music for the service, the readings, and other elements, can be discussed with the Vicar. As with marriage, there can be wide flexibility and choice. The personal touch is important, and will not be lost. You will be encouraged to offer suggestions which are appropriate; the Vicar will help in this with his/her own suggestions. Family members or friends are always encouraged to consider delivering the eulogy or tribute as a personal contribution to the service. The Vicar can do this for you if you choose. This also applies to participation in readings and music. Fees and charges for services at St John’s are variable, depending on the requirements of the family. These matters are usually worked out before-hand with the undertaker.